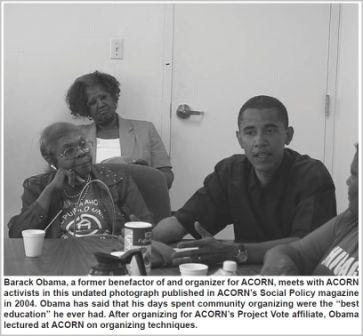 Barack Obama has a long history of ties to ACORN. ACORN was well acquainted with Obama before he ever ran for the State Senate in Illinois. The Cleveland Leader first reported that ACORN’s former board member Toni Foulkes detailed some of this collaboration in the Winter 2003-Spring 2004 issue of the journal Social Policy. Although Barack Obama was never a staff attorney for ACORN, PolitiFact agrees Obama did represent ACORN in court. ACORN endorsed Barack Obama for President early in 2008. ACORN PAC’s representatives went through an extensive process of interviewing each of the major Democratic candidates. ACORN is a national anti-poverty organization which has hundreds of thousands of members in low- and moderate-income neighborhoods in 104 cities. Barack Obama used to speak highly of his relationship to ACORN according to his website Organizing for America. Barack Obama's campaign paid an ACORN offshoot over $800,000 to "get out the vote." U.S. Sen. Barack Obama’s presidential campaign paid more than $800,000 to an offshoot of the liberal Association of Community Organizations for Reform Now for services the Democrat’s campaign says it mistakenly misrepresented in federal reports.